shralp.com is a one year old snowboarding video blog (vlog) site. Shralp releases a new video every Sunday. You can view the videos in your browser on the Shalp! PC site. I was pleasantly surprised by the quality of the videos. These are not your typical YouTube amateur videos. Production values are high and the images visually exciting. Shralp seems to “get” the potential of mobile video too. Right from the beginning, Shralp! has had a companion mobile web site and has offered mobile formatted videos for download on their main site. The mobile formats are .mp4 averaging 9 to 14 MB and 176×144 .3gp running from 2 to 3 MB. There are also higher quality formats for iPod, Zune and other media players. Sideloading is a good alternative if your are on a metered plan or you have a carrier like Verizon that blocks it customers from streaming or downloading off-portal videos. Shralp Mobile is on the Sports page at the Yeswap.com mobile portal. This entry was posted in Site Reviews, Sports, Video by Dennis Bournique. Bookmark the permalink. You were right, the videos were of very good quality. I guess I expected it to be of poor quality. Glad to see I was wrong. 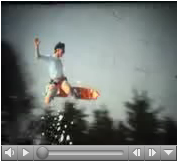 Hey you should check out this page http://www.snowboardvids.blogspot.com it has lots of snowboard vids on it. lots of teasers from 2007 as well. some pretty good riders. take care.